Check out all these amazing new Homies who joined in December, by logging in to the member portal and checking out their profiles in the Directory. HOME Listen & Learn- HOME Members are encouraged to bring their latest tracks (work-tapes, demos or masters) to the HOME Listen & Learn sessions to play in the studio for their peers. This is an open and welcome environment where all participants should be ready to receive and give constructive feedback & encouragement. This session will be limited to 20 people. HOME Collaborations- HOME will be hosting quarterly HOME Collaboration Sessions. Chosen participants will be separated into groups and assigned a breakout room to collaborate in. Click here to sign up. HOME Content Challenge- We are challenging 5 HOME Members every month to see how much they can produce when given 1 hour in the HOME Stage. At the end of the month they’ll show off their completed content for a chance to win additional booking credit. We have some great new promos taking place this month, check them out below. Refer a friend and they’ll get the first month free and you’ll earn booking credit for the amount of their first month ($10-$150). Just as Phillip Bernier- who just earned $100 for a new Production Member referral! Productivity Pledge Match- HOME is matching your pledges up to $1,000 for the month of January. Ex. You pledge $50 - you earn $100, You pledge $500, you earn $1,000. Click here for more details on both. 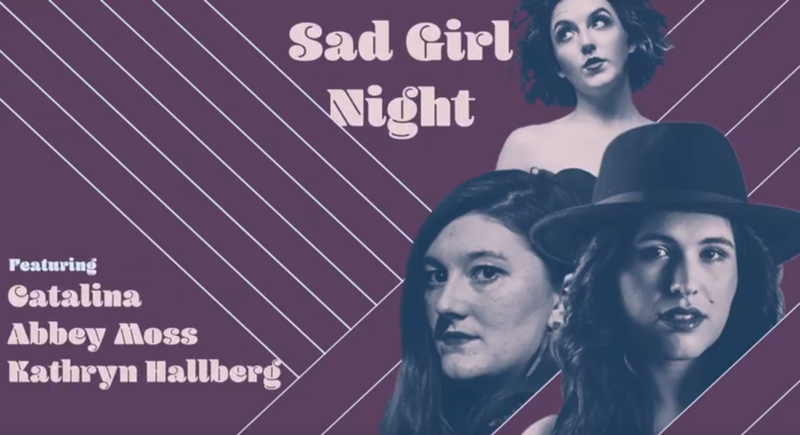 ***FREE SHOW*** Start your 2019 off right and come out to Sad Girl Night at Helping Our Music Evolve - HOME and celebrate the beauty, vulnerability, and power of some of Nashville's most talented ladies. Start the New Year off on the right foot with this free vocal (singing) workshops in Nashville. Breath is the fuel for singing. There is not “one setting” or “one size fits all” for vocal support (breath). This workshop is designed to give you some insights on developing more understanding and control of breathing in context to the voice. And we’ll probably dispel some myths and misinformation that is commonly taught along the way. This is the first of a series of 3 vocal workshop designed to get your voice in shape for 2019 . We invite everyone seeking help with their music craft, music projects, branding, and content, in the new year, to join us Tuesday, January 22, from 5:30-8 PM at H.O.M.E. for our first ever HOME Creative Fair. This Creative Fair will feature Content Creators (Producers, Engineers, Videographers, Photographers, and Graphic Designers) & Music Educators (Music Instructors, Vocal Coaches, Performance Trainers, and Business Advisers). This is our way of giving back to the Music Community by helping them meet their artist goals in the new year. It also serves to help our members that offer professional creative services to expand their businesses and make new connections. Each vendor has offered to give all HOME Members a discount on their services. Doors at 5:30 PM. Showcase 6:00-8:00 PM. 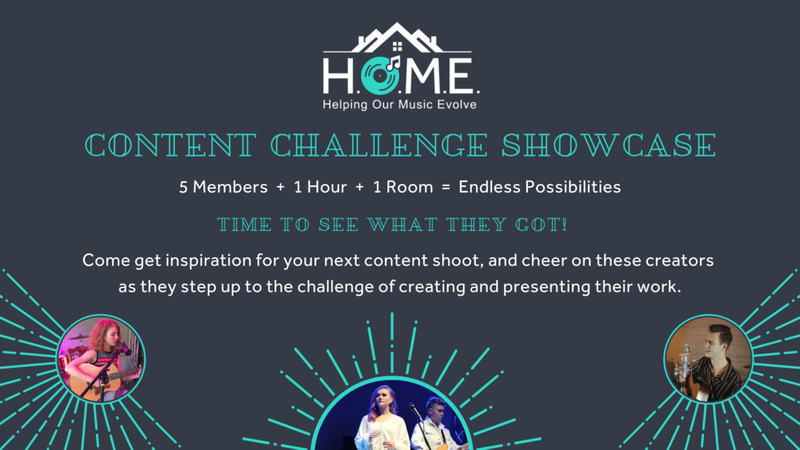 Join us on the last Tuesday of ever month for the HOME Content Challenge Showcase. Each month 5 members will be selected to participate and given the chance to win $200 in Booking Credits. Come get inspiration for your next content shoot, and cheer on your friends as they step up to the challenge of creating and presenting their work. Interested in participating in the challenge in the future? Click the link below to sign up. As this will be our first Listen & Learn session- we cannot guarantee that all attendees will have their songs played. We’ll have a sign in sheet available upon arrival and go in sign up order. Based on the length of feedback and space in the studio, we’ll adjust the RSVP limit for the next session in February. First Monday every Month from 6-9 pm. Come learn from folks actually in the Music Business and Network with like minded individuals. Rick Barker former Manager of Taylor Swift and Host of The MIB Podcast will have different guests each time from various sectors of the industry in order to help you get a better understanding of what is out there for you and how to get it! Limited Space, First Come First Serve. CLICK HERE To Learn More. Needing some inspiration for your upcoming album artwork? Check out The 20 Best Album Covers of 2018. Curious about what other HOMIES have been creating at HOME? Check out this live acoustic cover of Allen Stone's "Unaware", by Paul Vinson and Miette Hope, recorded in the HOME Space.